Olivier Panis enjoyed one of the longer Formula One careers - but his only win in 158 races came in the wet at Monaco in 1996. It was a superb drive in tough conditions but he managed only five other podium finishes. Panis came into F1 on the back of taking the Formula 3000 title in 1993, and his debut season for Ligier in 1994 showed promise as he managed to finish 15 of 16 starts, including second place at a retirement-strewn German Grand Prix. Reliability was more of an issue the following year, but he was again in good form and was never out of the top ten when he did manage to go the distance - he was in the points in six races and finished with another second, this time at Adelaide. His third and final year was his least successful but did contain his win at Monaco, to date the last F1 victory by a French driver. Starting back in 14th, he made the most of several high-profile retirements but also drove superbly to take the victory. In 1997 the team became Prost and Panis started with four top-five finishes in the first six races, but in Canada he crashed heavily and broke both his legs, ending his season. It was a massive blow as world champion Jacques Villeneuve later said he regarded Panis as a real threat. Although he returned in time for the start of 1998, albeit still troubled by pins in his legs, the Prost team was in trouble, almost failing to make the first race as the car has not passed crash tests. Panis only finished once in the top ten, and only a single point from Jarno Trulli spared them from last place. 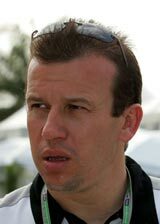 Panis managed two sixths in 1999 and quit the team at the end of the season. He opted to join McLaren as a test driver - there was talk of a Williams drive as well - and he impressed there, landing a drive for BAR in 2001. As with Prost, the team was not an ideal showcase for his talents and in each of the next two seasons he managed a brace of top-six finishes but retired as often as he finished. A switch to the relatively new Toyota team in 2003 was equally frustrating, a fifth in Germany his only point-scoring finish that year, and another fifth in the USA his best in 2004. Towards the end of that year he announced his intention to retire - he was by then 37 and the oldest competitor in the field - although he continued as a test driver for Toyota until the end of 2006 when he quit F1 completely.